Hair regrows automatically so that the total number of hairs on our head remains constant. Telogen effluvium occurs when there is a marked increase in hairs shed each day. 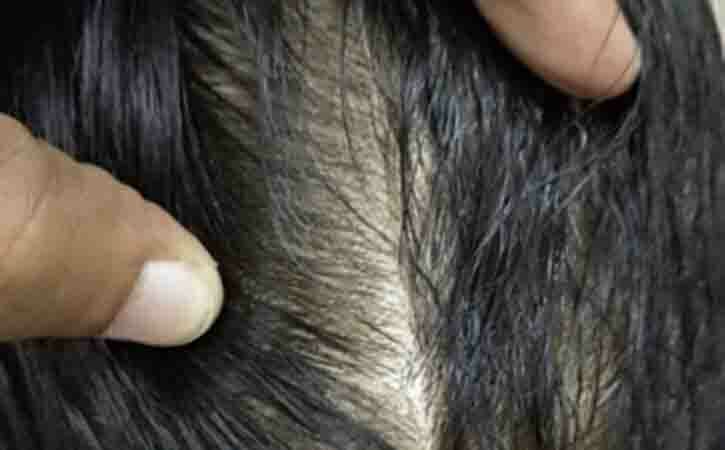 An increased proportion of hairs shift from the growing phase (anagen) to the shedding phase (telogen). Normally only 10% of the scalp hair is in the telogen phase, but in telogen effluvium this increases to 30% or more. This usually happens suddenly and can occur approximately 3-5 months after a trigger. Telogen effluvium occurs if all the hairs enter into the resting phase together, most commonly after childbirth or severe illness. Stress of any type, such as an acute illness or an operation, causes a similar type of hair loss. People become aware when losing hair is increased. This is noticeable after washing or brushing with more hair being found in the plug hole or on the hair brushor comb. Some people will notice increased hair on the pillow in the morning or around the house. Telogen effluvium first appears as a thinning of hair on the scalp. This thinning may be limited to one area or appear all over. It affects the top of the scalp most often. Rarely will telogen effluvium cause hairline to recede. It’s also unlikely that losing all hair. Some severe cases, telogen effluvium can cause hair in other areas to fall out, like eyebrows and pubic region. Latter Beau’s lines may be seen on the nails. Usually there are no symptoms, but occasionally telogen effluvium can be accompanied by tenderness and altered sensations in the scalp known as trichodynia. Severe stress. Prolonged stress can result in telogen effluvium. Hair loss typically occurs about 3-5 months after the stressful event. Pregnancy and childbirth. During pregnancy, more hair is in the growth phase for longer. Hormonal changes that occur 3 to 6 months after birth can cause hair to shed. Medications. Some antidepressants and other medications like antihypertensives and oral contraceptives, may cause hair loss. Some surgeries or vaccinations can cause a shock to the system and put the hair follicles into a resting state. Hair growth typically returns to normal within a few months. Health conditions. These can include autoimmune disease, conditions that affect the thyroid gland, and alopecia areata. In fever, it can exceeds 102.20 F, particularly with recurrent episodes cause telogen effluvium. It has been reported in a wide range of infectious diseases, including glandular fever, influenza, malaria, and brucellosis. It also occurs in fever associated with inflammatory bowel disease. Metal toxicity. Contact with toxic chemicals in metal can lead to telogen effluvium. Environment: Physical trauma, like being in a car crash, having blood loss, or having surgery, might trigger telogen effluvium. Exposure to toxins like heavy metals may also cause this condition. This is because the shock of the environmental change causes your hair follicles to go into a resting state. When hair follicles are in a resting state, they don’t grow as they normally would. Although this type of telogen effluvium can occur quickly, you likely will not experience any noticeable thinning until one or two months later. If the environment is stable, your hair can quickly return to normal. This type of telogen effluvium usually clears up in less than six months. Your hair will typically return to its normal state within one year. Hormones: Experiencing a sudden change in hormone levels can trigger telogen effluvium hair loss. Similar to an environmental change, hormone fluctuation can cause hair follicles to go into a prolonged resting state. This condition is unaffected by therapy, but patients can be reassured that their hair fall will be temporary. There is normally no treatment required for telogen effluvium as the hair will start growing back once the trigger is removed. Treatment for telogen effluvium depends on what is triggering the hair loss. Treatments for telogen effluvium can range from lifestyle changes to trying out over-the-counter products. Protein: meat, eggs, fish, beans, grains, and nuts. The amino acid lysine may be particularly important for hair growth. Iron: may be linked to telogen effluvium. Red meat, liver, dark green leafy vegetables, beans, and lentils. Hair care: It’s important to styling hair gentle. Avoid blow drying, straightening, or curling hair until condition improves. Frequent coloring or highlighting during this time can also damage and inhibit hair growth. Over the counter products may also help regrowth. Be sure to select with contains 5 percent minoxidil. This is a once-daily topical product that’s applied to the scalp. It works by prolonging the anagen, or the active growth phase of the hair follicle. Relax: If hair loss is related to stress, try to reduce stress levels, it may also help. Hair replacement: non-surgical hair replacement is an option. Hormone replacement: It’s another option which may help incase of deficiency. Avoid chemical or heat treatments: Avoid heat styling and heat treatment, such as curling the hair. To identify the cause, need professionals help. Like: If vitamin supplements are the primary source of these nutrients, should talk with a doctor or dietician. They can work to develop a healthy diet. Crash dieting should be avoided, as it has been known to cause telogen effluvium.